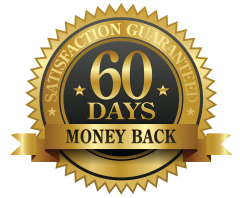 This program is backed by a 100% money back guarantee for 60 full days from your original purchase. If you're not totally and completely satisfied with this program, your results or your experience in the first 60 days from your purchase simply let us know by dropping us an email and we'll give you a full refund within 48 hours, no questions asked refund. ClickBank is the retailer of products on this site. CLICKBANK® is a registered trademark of Click Sales Inc., a Delaware corporation located at 1444 S. Entertainment Ave., Suite 410 Boise, ID 83709, USA and used by permission. ClickBank's role as retailer does not constitute an endorsement, approval or review of these products or any claim, statement or opinion used in promotion of these products. The website's content and the product for sale is based upon the author's opinion and is provided solely on an "AS IS" and "AS AVAILABLE" basis. You should do your own research and confirm the information with other sources when searching for information regarding health issues and always review the information carefully with your professional health care provider before using any of the protocols presented on this website and/or in the product sold here. Neither ClickBank nor the author are engaged in rendering medical or similar professional services or advice via this website or in the product, and the information provided is not intended to replace medical advice offered by a physician or other licensed healthcare provider. You should not construe ClickBank's sale of this product as an endorsement by ClickBank of the views expressed herein, or any warranty or guarantee of any strategy, recommendation, treatment, action, or application of advice made by the author of the product.